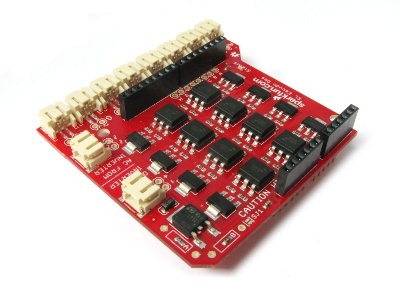 Sparkfun's EL Escudo Dos makes it easier than ever to create EL displays. This Arduino shield has connections for an EL inverter (a small module that generates high voltage AC), and provides eight EL output connectors that your Arduino sketch can turn on or off under software control. This allows you to easily create animated EL displays, signage, or whatever your imagination can come up with! Before we go any further, here's a brief warning: EL WIRES RUN ON HIGH VOLTAGE. Don't worry, it's "only" 100V and very low current, so it's generally not dangerous. However, getting shocked is a bit unpleasant. If you're careful, there's no reason for this to happen. Unless you cut it (which you can, just insulate any exposed edges afterward), all EL wire / tape / panels safely seal the high voltage within a layer of plastic. But do keep in mind that like many of Sparkfun's products, the EL Escudo Dos is a bare board with exposed components and traces. To avoid shocks, always power down your entire circuit before plugging and unplugging connectors, and don't touch any exposed metal on the board while it's operating. For extra safety on public projects, we recommend enclosing it in a case or otherwise isolating it from curious fingers. Solder stackable headers to the EL Escudo Dos. Plug the EL Escudo Dos into the Arduino of your choice. 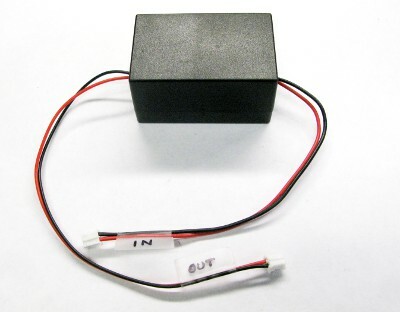 Attach your EL wire / tape / panels to the "A" through "H" output connectors. Load the example sketch or your own code onto the Arduino. To plug your EL Escudo Dos into an Arduino, you'll first need to solder stackable headers to the board. (We don't preattach these to keep retail costs down, and because many users want to wire directly to the board.) 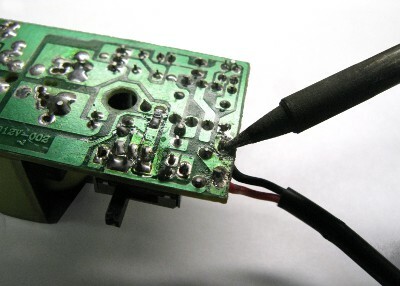 If you've never soldered before, don't worry, it's easy, although you may want to practice on something else if this is your very first time soldering. The six and eight-pin stackable headers go into the matching groups of six and eight holes on the board. (The correct holes are surrounded by white rectangles.) The black plastic socket side of the header goes on the component (top) side of the board, and and the pins stick out the bare (bottom) side of the board. An easy way to solder these headers to the board is to insert all four headers into the board, then flip the assembly upside down and place it on a flat surface. Then you can solder the joints from the bottom (now facing up) side of the board. Don't forget to wear your safety glasses! It's important for the headers to be soldered on straight so that they will easily plug into an Arduino, and other boards can plug into them. A good way to ensure this is to solder only one pin on each header, then check the alignment. If it's not straight, remelt the joint and quickly straighten up the header before the solder cools. Once the header is straight, finish soldering all the joints. Try not to get too much solder on the long pins that are sticking up, as these need to be clean in order to plug into the sockets on your Arduino. That wasn't so bad, was it? Plug the EL Escudo into your Arduino, and let's keep going! To drive your EL wire, you'll need an EL inverter. An EL inverter takes in low-voltage DC, and boosts it to the high voltage AC (100V, 1000Hz) necessary to make EL wire glow. 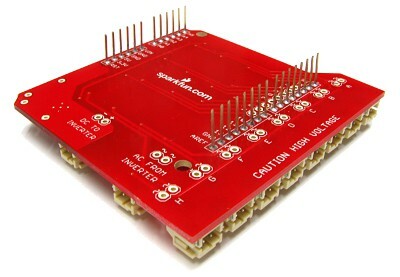 SparkFun carries two inverters, a 3V version and a 12V version. The 3V version is great for battery-powered systems, but is best for small displays since it can only drive a few meters of EL wire. If you have 12V available, the 12V inverter is considerably stronger and is capable of driving dozens of feet of wire at high brightness. A note about brightness: The brightness you get will depend on the strength of your inverter and the total length of EL wire you're driving. The less EL wire you're driving, the brighter it will be. This is important to remember because the EL Escudo Dos has eight output channels. If you turn on only one channel at a time, the wire connected to that channel will be bright. But if you turn on multiple channels simultaneously, the brightness of all the EL strands will decrease, because the total length of EL wire you're driving has increased. If you use a strong inverter such as our 12V model, this generally isn't a problem, even for all eight channels being on simultaneously. However, for smaller inverters such as our 3V model, you may want to plan your display so that the wires are short and you're not driving too many channels simultaneously. BEFORE CONNECTING ANY INVERTER OR EL WIRE TO THE EL ESCUDO DOS, ENSURE THAT EVERYTHING IS POWERED OFF! Because of its low voltage requirements, Sparkfun's 3V inverter is ideal for small, battery-operated EL displays. The 3.3V supply built into many Arduinos is not strong enough to run this inverter, so the EL Escudo Dos has its own built-in voltage regulator. The regulator comes preset to 3.3V, which is ideal for this inverter, but it can be changed to other voltages for other inverters. See the schematic for details. 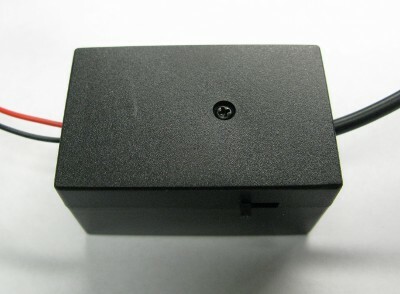 The 3V inverter has two JST connectors attached to it; a DC input (with red and black wires), and an AC output (with two black wires). To connect the inverter to the EL Escudo Dos, plug the JST connector with the red and black wires (the DC input) into the Escudo's "DC TO INVERTER" connector. Next, plug the JST connector with the two black wires (the AC output) into the Escudo's "AC FROM INVERTER" connector. That's it! The voltage regulator on the EL Escudo is connected to your Arduino's VIN pin, which is in turn connected to the raw power input to your Arduino. Depending on your Arduino and how you're powering it, this could be the power jack, the USB connector, or a battery connector. The voltage regulator on the EL Escudo requires an input at least 1.5V above the output in order to operate. This means that the Arduino needs to be running on at least 4.8V for the regulator to be able to output 3.3V. If you have 12V available, or want to make the biggest, brightest display possible, Sparkfun's 12V inverter is a great choice. Off-the-shelf, the 12V inverter comes with a barrel plug connection for the DC input. This makes it easy to power directly from a 12V wall-wart. If you'd like to power it this way, connect the DC input to a 12V wall-wart, and connect the AC output JST connector to the Escudo's "AC FROM INVERTER" connector. That's it! The EL Escudo Dos has a built-in voltage regulator that takes the raw voltage on the Arduino (VIN), and regulates it down for low-voltage inverters such as Sparkfun's 3V model. But since we can run both the inverter and the Arduino on 12V, we don't need that regulator any longer. We can bypass it by closing solder jumper SJ1, which is located just below the "C" in the "CAUTION HIGH VOLTAGE" label on the top side of the board. 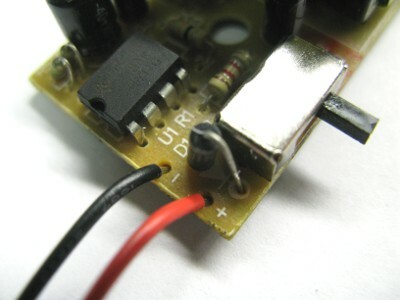 Use your soldering iron to place a blob of solder on that jumper, connecting both sides together. 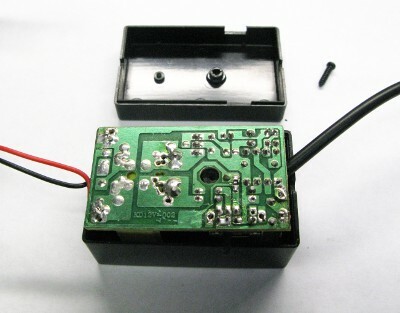 When you close this jumper, the VIN pin (12V) will be connected directly to the "DC TO INVERTER" connector, allowing you to power your inverter via the same 12V supply powering the Arduino. 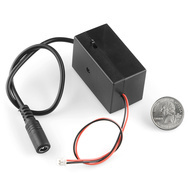 The DC input on Sparkfun's 12V inverter has a connector that accepts a wall-wart plug. This is usually a great feature, but in this case, we'd rather have that input be a JST connector so we can hook it directly to the EL Escudo board. Never fear! We can easily hack one in. First, open up the inverter's case. It may look like there's no way to do so, but peel off the round sticker, and you'll find a Phillips screw below it (tricky!) Remove the screw, open the case, and take out the inverter's PCB. Now we'll solder in the new JST pigtail. Strip the wires a quarter-inch or so., insert one wire at a time into the proper location, and apply solder to the bottom of the board. When both wires are soldered, clip off any excess. Before reassembling the case, it's a very good idea to mark which JST connector is the input, and which is the output, since they're now identical. Put everything back together, plug the DC input you just made into the "DC TO INVERTER" connector, plug the AC output into the "AC FROM INVERTER" connector, and we're ready to fire things up! Attaching EL wire, tape, etc. This is the fun part. Plug up to eight EL wires, tapes, panels, etc. into the output channels of the EL Escudo. These are the JST connectors labeled "A" through "H" along the edge of the board. Once the Arduino is powered up, load the example code. Once it's running, both the status LED on the Arduino, and the status LED on the EL Escudo should be blinking. Turn on the inverter (if it isn't already), and hopefully you'll see your EL wire blinking away! Are you running code that turns on that EL channel? If you're using the 12V inverter, is the inverter's built-in power switch on? Power everything off, and ensure the JST connectors are fully seated. Power up the board, and use a multimeter to check the DC voltage at the "DC TO INVERTER" connector (you can use the holes adjacent to the connector). Is the appropriate voltage for your inverter present? Power up the board, and (carefully) use a multimeter to check the AC output of the inverter, at the "AC FROM INVERTER" connector (you can use the holes adjacent to the connector). The inverter must be powered on for this test, and your multimeter must be set to VAC. Are you reading in the vicinity of 100VAC? If your EL wire is blinking, and you think it should be steady-on, and you're using the 12V inverter, check the position of the inverter's power switch. This inverter has a built-in blinking circuit which runs if the switch is in the middle position. If you've checked all these things and you're still having problems, please feel free to contact our Technical Support department, who will be happy to help you out. Programming the EL Escudo Dos is very easy. 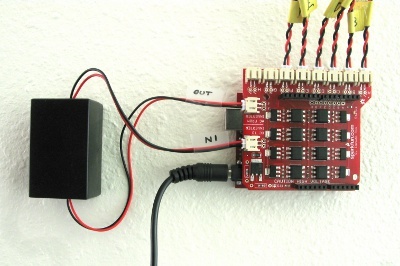 No libraries are needed; controlling the output channels is as simple as turning a LED on or off. In fact, that's exactly what you're doing - inside each of the eight optotriacs on the board is an LED that is internally coupled to a light sensor on the high-voltage side. By using light to bridge the gap between the AC and DC sides of the circuit, there is complete electrical isolation, which makes the board safe and reliable. It's that easy! See the example code for a basic framework to build on. Can I dim the EL wire? The quick answer is not really. You may be able to achieve a few dimming levels by using the analogWrite() command, but because this board uses zero-crossing triacs and there's no synchronization between the AC waveform and your Arduino's PWM, dimming isn't terribly effective. Some analog levels will produce stable dimming zones, others will produce flickering. You can't hurt the board by doing this, so feel free to experiment; you will probably find a few levels that work well, and maybe flickering is exactly the effect you're looking for. Remember that not all pins on an Arduino support PWM, so you'll be limited to "dimming" channels B, D, E, and H.
Have fun with your EL Escudo Dos! how do you program a chasing EL wire to get the movement effect ? I have a problem with my dos. I am not using as a shield but just wiring the pins 5,6,7 to my bare conductive board and hooking it up to ground and a 12 power supply. The idea is when you touch one of the 3 of three touch pads on the bare board linked to pins 5, 6 or 7 the corresponding elwire strip comes on. Everything is working as it should but I can't get all 3 pieces of wire to turn off on those pins. They will turn on in series or together and are really responsive otherwise. It always wants to leave one on no mater what. I verified with my multimeter none of the arduino pins are sending voltage when this happens which means this is definitely happening on the el escudo. With regular LEDs, it's perfect so I do know the code is correct. Thoughts? Suggestion? Should I connect something else? An interrupt of some kind to a pin? I must be losing something not using it as a shield. Ideas? First guess is there's something weird going on with your power supply system. Are you powering the shield and the inverter from the same 12V? Do you have a common ground between your bare conductive board and the Escudo? There also is the possibility that it could be an issue with the tape/wire you are using. Try switching the order that the wires are connected on the board and see if the issue follows a particular wire or if it stays on a certain pin on the Escudo. That will help narrow down where to check for issues. Ok so I linked the inverter dc wires to the batt terminals, successfully uploaded the example code and soldered my own (lets call them positive) leads to each pinout with one common (negative) from pin 'A' linked in series to all the EL panels. My goal is to make a (one on at a time) chaser array but what I get is all the panels blinking on and off in unison. Does each panel require two independent leads. or did I muck something else up? 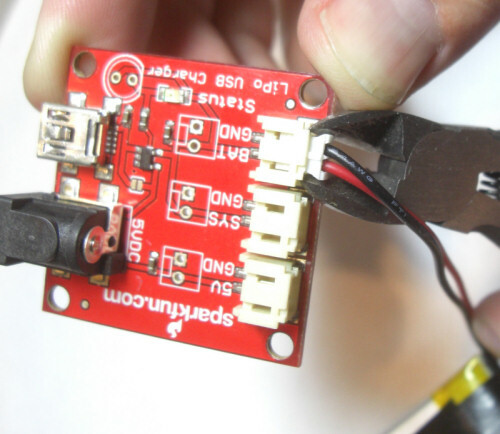 If you're using Sparkfun's 12V inverter, make sure that the switch is in the fully-on position. There's a middle position that blinks the output. its a radioshack one that i bypassed so it only stays on solid. Using the latest board. If you are using the Escudo Dos, you will set the Arduino software to whatever Arduino board you are using in conjunction with the Escudo shield. Hi, I would like to use this sequencer with a Bare conductive touch board. It essentially works like an arduino but the board setup means I won't be able to plug the shield directly to this. Could you tell me which pins from the El Escudo need to be connected to the arduino board in order for for me to be able to program it? I will then just solder directly to the board. Thank you! The EL Escudo uses Arduino pins D2 through D9 to control the eight output channels, and wants power on VIN and GND. If you don't need all eight channels you can just connect the control lines you do need. Great thanks! I just got my sequencer and I've tested it with the teensy 2.0. Works well. the 3V inverter should do..
Hello. I have the El Escudo Dos set up as mentioned above. It's connected with the pins to an Arduino Uno board. I have the 3 Volt inverter, and I have my laptop connected wtih USB to the Arduino to load the program. I'm having issues loading the program though. It gives an error saying "Board at COM4 is not available" even though the IDE on the lower right portion says the Arduino Uno is at COM4. So I have the following questions: 1) which version of the Arduino IDE was used in this tutorial? I currently have Arduino 1.5.5. 2) which board is selected under Tools->Boards? I've selected just Arduino Uno. 3) which programmer option was selected? (ie AVR ISP, AVRISP mkII, USBtinyISP, USBasp, Parallel Programmer, Arduino as ISP?) 4) is there any additional config files needed to make the Arduino Uno work with the El Escudo Dos, or El Sequencer? if so, how do you load it into the IDE? Sorry for so many questions but I'm really trying to learn this, thanks. Hey im having trouble turning on the status lights from the example code. I followed all the instructions and tested all the troubleshooting methods. Is there anything you suggest i test? This occurs on all 4 of my shields. The above example code doesn't blink the status LEDs on both the shield and the Arduino? Does it blink either of them? Are you sure that this or any code, such as the basic "blink" sketch, is uploading to the Arduino properly? If you continue to have problems, contact our Tech Support Department who will be happy to help you. Only the status light for the Arduino blinks from the example code. Also I rewritten the code so that the both status lights would be on but I still get only the Arduino to response. I have tested this on all my 4 shields and 4 Arduino Unos. That's very strange, possibly bad stacking connectors between the Arduino and the shield? Sorry for the problems you're experiencing, I recommend contacting Tech Support, they'll be able to get you up and running. Would there be a difference because I was using the breakaway headers -straight? Should I being using different headers? I will also contact Tech support. LED instead of el wire?, or some other board? Some other board. This board is exclusively for EL wire. It depends on what you want to do, but most Arduinos can control about 18 LEDs directly and many more if you are using addressable LEDs. I am trying to use the the El Escudo Dos with the capacitive touch sensor bob, and I have hit a snag: Is there any way for me to use digital pin 2 as an interrupt pin? I am afraid I'll fry whatever I plug into pin 2. One idea is to cut the male stackable header on pin D2, in use a 90 degree pin to my bob. Hi, i just bought this one and connected with the arduino uno, soldered, connected with 12v inverter (soldered JS1) and its working with a 12v input through the ard. board I got a couple of questions.. If the USB is connected than it still runs but very low power. i was wondering if this can harm anything- ardunio, el escudo dos, inverter, el wires or even the power adapter somehow. I also googled for stacking the shields up, i want to stack lolshield on this.. do i need to check the schematics and determine which outputs are used by both and if they share the same that i cant stack? Is it safe to turn off the inverter for a long time with the power still going in? I hear a very faint sound when the lights are turned on, coming from the inverter.. is that normal..? Hi, Great tutorial, thanks! I'm brand new to this and aim to build a wearable project. Is it possible to control the on/off illumination of a single EL Panel based on input from either a sound sensor (such as the Breakout Board for the Electret Microphone) or a distance sensor (like the Maxbotix Ultrasonic Range Finder)? For example, once the sound reaches a certain level, the EL panel turns on. I have a sketch that turns on a single LED based on the microphone's amplified input...wondering if it's compatible with the setup described here? Thanks in advance! Hi there! If you have a sketch that turns on an LED when you want it to, then you can definitely get the EL Escudo or EL Sequencer to do what you want. The Arduino-side circuitry is based on LEDs turning on and off, so you should be all set. Have fun and please let us know if you have any questions or problems. Hi Mike. Thanks for this tutorial. I have a particular scenario that's slightly different and I'm not sure how to proceed. Hope you can help. I am working on a project that includes a Lilypad Simple (5v max), El Escudos Dos (12v fine) and a the EL 12v inverter to drive 3 EL panels 10x10cm (12v should be ok as only 2 would be on for a max of 8 seconds). I have with me a couple of lipoly batteries a 3.7v and a 11.1v. What do you recommend on this setup? Ideally I would like to run all on the 11.1v lipoly but that would be the end of the Lilypad. Can I use the 3.7v to power the lilypad and the 11.1v directly to the inverter? Would this two battery setup still pass-through 12v to the inverter? Update: Using the lilypad as this is a wearable project. Thanks. Hi Juan, a two-battery setup is probably the simplest way to do this. Run the Lilypad off a 3.7V battery, and run your 11.1V battery into the VIN pin on the EL Escudo. Use your soldering iron to put a blob of solder on SJ1; this will send 11.1V to your 12V inverter. Now you just need to connect three of the LilyPad's outputs, to the inputs on the EL Escudo (you can use the row of eight holes near the status LED marked A through H). You should also connect a ground line between the LilyPad and the EL Escudo. Everything should work fine. Two things I'll mention: when the inverter is on, portions of the EL Escudo will have exposed high voltage, so be careful not to locate it where you or someone else might touch it or brush against it (it's not dangerous, but it is unpleasant). Also, since the EL Escudo wasn't really designed for fabric projects, instead of going through the trouble of connecting it to a LilyPad, you might consider just plugging a standard Arduino (such as a 5V Pro) into the EL Escudo. You could use one battery (your 11.1V) to power both the Arduino and the inverter. It will be a little bulkier, but because they just plug into each other it would be quite a bit easier to set up. This is excellent. Will def protect the circuitry with a 3D printed enclosure and layers of fabric. I think I will try both options you suggested. The lilypad-El Escudo was my setup for the raw prototype. The project should evolve to include a GPS and a couple of sensors to trigger the EL panels. I had not thought about using a 5V Pro but instead replacing the lily for a 5V Pro Mini when the prototype is fully working but I will be getting a 5V Pro as it will be indeed less hassle down the road and footprint is great. I am also considering building my own 4 port El-Escudo PCB so I can reduce the footprint and weight (any ideas if there is a 11.1v-happy commercial version I can use?). The ultimate goal is to stick to just one 11.1v battery setup for the whole project one that I can I can recharge via USB. My solution to the tight fitting JST connectors is to trim a bit of the height off of the locking pins, with a modelling knife, before the first use. This method maintains the locking function while reducing the release force below the breaking force of the wires. I'm trying to run 7 pieces of 1 meter EL Tape and one 10x10 cm panel using a battery. What's the highest capacity LiPo I can use if I want to connect it to a 12V inverter? Follow up? : Is it possible to run an Uno, El Escudo w/ 7 meter long tapes, one 10x10 panel, a Lilipad w/ approx 60 LED's all off of one LiPo? and still be portable? Or is it best to use separate batteries for the EL, Arduino, and Lilipads? Any comments/guidance is much appreciated. Can't access forums now, but I will post there as well when not confined by the corp firewall. I'm not quite sure what you mean by "capacity". The way we define it (amp-hours), you can pick any "capacity" you want, from a stack of AAAs to a car battery. They will all provide the same voltage, but they will last for different amounts of time. The first thing you should probably pick is a voltage, and since you're using the 12V inverter, you can use anything that's in the vicinity of 12V (running the inverter directly), or higher (using the regulator built into the EL Escudo). 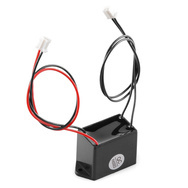 For example, you could run the 12V inverter off an 11.1V Lipo directly. That battery is 1500mAh, so it can provide 1500mA for one hour, or 500mA for three hours, or 100mA for 15 hours. If you're running 60 LEDs at 10mA each, that's 600mA right there, and the inverter + EL will probably take another 100mA, so you're looking at two hours runtime (worst case, this will increase dramatically if you don't have all 60 LEDs on at the same time). If you need more runtime, there are other 12V batteries out there with different amp-hours, up to and including car batteries if you want your project to run for 100 hours or more. Thanks Mike! I see the 12v EL inverter has a barrel connector and JST. Do I need to cut the barrel jack and connect a jst cable instead? Also, how do you recommend connecting the Lipo to the arduino and shield? Can I have one battery for both or do they need seperate ones? At this point, the plan is to run the El Escudo and Arduino independent of the lilipad circuit. Thanks again. And that definitely helps. The above tutorial has instructions on how to replace the barrel jack on the 12V inverter with a JST pigtail. Once you do this, you can run the Arduino and EL Escudo on the same power supply (connected to the main Arduino board). To power the Arduino from a battery, the easiest thing to do is probably splice a barrel jack onto your battery. For one of our Arduino Pros. you could do the same thing with a JST connector. Glad this helps, please let us know if you have any other questions! Lets say I am using a 3v micro, is the logic going to be compatible with the optoisolators? Yes, we've tested it and it works well with both 3.3V and 5V Arduinos. Is a 7.4V Li-Po Battery with the 12V Inverter gonna turn my EL wire bright or dim ? It will be somewhat dim, but may be usable in a dark location. If you can switch to a 3-cell 11.1V LiPo battery, you'll have a much brighter output. Can you adjust the input voltage to the 12V inverter to adjust brightness? Or the output of the inverter? In both cases I'm just thinking some simple analog circuit. Interesting idea! The output of these inverters is roughly proportional to the input, so you could accomplish this by changing the input voltage. You might be able to do this by replacing one of the regulator adjustment resistors on the EL Escudo with a digital pot. Let us know if you try this out. I have figured it out and digital pots won't work on many applications, too limited. They cannot block the 200V, around 2.15mA for 3 meter from inverter. If we were to block it from the battery, the current that flows from the battery is too high (around 20mA permeter). Digital potentiometers are too low power. The closest thing to use a digital potentiometer is: Each continuous EL wire segments cannot have more than 1 meter. An inverter is needed for every segment of EL wire. I wasn't referring to using the digital pot on the input to the inverter; this board contains an LM317 adjustable voltage regulator that includes two voltage-setting resistors. You may be able to replace one or both of these with a digital pot, which would affect the output from the regulator. I wonder if I could just have a capacitor parallel to the output from Arduino before the phototriac? There is also a resistor in there that makes it a low pass filter. So then I could dim EL wire all the way without flicker? Triacs don't run well unsaturated; they like to be either full-on or full-off. If you look into AC dimming, you'll see they typically you'll synchronize with the AC waveform and turn on/off at a specific point into that waveform. This takes more circuitry than is available on the EL Escudo or Sequencer. Oh, but then it can only adjust all EL wire brightness at once.